CANDELS: How Far Away is this Galaxy? In previous posts you have read a lot about redshift and the distance of galaxies from us. You have read how to find and select very distant galaxies and how to distinguish between different types of galaxies from their spectral energy distributions. What you haven’t read in more detail is how astronomers determine a galaxy’s distance or redshift. I’ll tell you a bit more about this now. 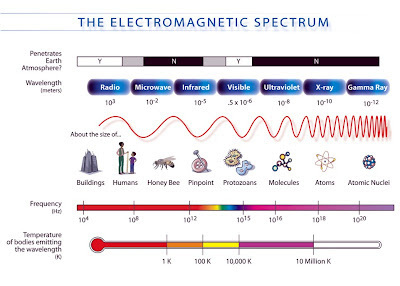 The electromagnetic spectrum: wavelengths get smaller from the radio to gamma rays. First of all, let’s recap again what redshift means. I guess all of you have heard an ambulance with its siren switched on passing by. You might have noticed that the pitch of the siren changes as the ambulance moves. In particular it sounds higher when it approaches you and deeper when it drives away from you. (The same is true for the sound of passing by race cars which make the popular "brrrmmmmm" sound kids love so much.) This effect is called the Doppler Effect. While the ambulance moves, the sound waves coming from the siren are squeezed when it drives in our direction and stretched when it moves away from us, resulting in a different sound. The same happens to the light of distant galaxies. The Universe is expanding and so distant galaxies are moving away from us. The light emitted by these galaxies is stretched out on its way to us. If the galaxies were moving towards us, their light would be squished. Because light can be described as a wave just like sound, this stretch/squish means that its wavelength is changing. Blue light has a shorter wavelength than red light, so light that is blue when it is emitted turns redder on its way to us when the galaxy is moving away, hence we say it is redshifted. The light from distant galaxies takes a long time to reach us. The further away the galaxy is the longer it takes, because light travels with a particular speed and nothing is quicker than light. So if we know the redshift of a galaxy, we know its distance to us and with this we know how long it took the light we see today to get to us. Hence, we see distant galaxies not as they are right now (this light is just emitted and hasn't reached us yet), but as they were a long time ago. With a particular redshift astronomers can assign a so-called look-back time which is the time the light of a galaxy at this redshift took to reach us. For example, the light of the sun takes 8 minutes to reach Earth, but it takes about 5 hours to reach Pluto. The light of distant galaxies needs billions of years to reach us which means they existed when the Universe was very young. I've listed the look-back times and ages of the Universe for some redshifts above (for the very cosmologically interested: using a Hubble constant of 71 km/s/Mpc and Omega Matter, describing the density of matter in the Universe, of 0.27 assuming a flat Universe, but you can play yourself with these values over here). Redshift 0.0043 is the redshift of the closest large galaxy cluster to us. Up until redshift 0.5 the galaxy population is pretty well mapped out and studied by surveys such as SDSS. The range between redshift 1 and 3 is interesting to researchers to study how galaxies assemble their mass as we told you in this previous post. Redshift 7 is close to the redshift of the most distant galaxy known to date. With CANDELS we hope to detect many galaxies at this redshift and even further away. We hope to discover galaxies at redshift 10 someday, which were perhaps the first galaxies to form in the early Universe. There are two ways to determine the redshift or distance of a galaxy, either from the spectrum of that galaxy or from its spectral energy distribution (SED) and colours. 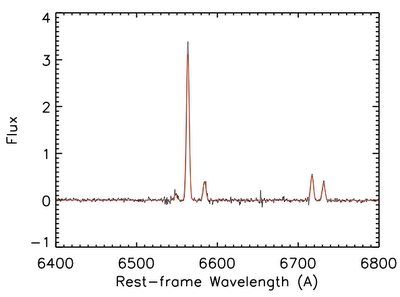 If astronomers have spectra available, they look for particular features in each spectrum, such as emission lines (those spikes in the figure to the right) or absorption lines. Emission and absorption lines are caused by elements in the galaxy that emit or absorb the light of that galaxy’s stars at particular wavelengths. From lab experiments we know at which wavelength the lines of various elements should be when not moving, we call this the rest-frame wavelength. We also know what their separation in a spectrum is. In order to determine the redshift of a distant galaxy one can look for the spectral lines caused by elements in that galaxy. Since the elements are located within that distant galaxy, the wavelengths of the spectral lines are redshifted by the same amount as all other light coming from the galaxy. We say these observed spectral lines are in observed-frame. The difference between the rest-frame and observed-frame wavelength of a particular spectral line lets you calculate the redshift of the galaxy. The difficulty with getting redshifts from spectra lies in the identification of the spectral lines, you need to be sure that the line you are seeing comes from the element that you think it is. It is easier if spectra have several lines that can be used to determine the redshift because then you can identify the pattern of lines, and know without a doubt what the observed lines are. A redshift determined from a spectrum is called 'spectroscopic redshift'. light from such galaxies traveled about 8 billion and about 10 billion years to reach us!! the SED post. Galaxy templates are taken from Polletta et al. Taking spectra of many galaxies is very time-consuming and requires a lot of telescope time, which can be difficult to get. Instead, with imaging, you can observe thousands of galaxies at once and construct an SED by using multiple filters. In this case you can still determine the redshift of a galaxy by using SED-fitting. Astronomers take advantage of the fact that the SEDs of galaxies have particular shapes and features at specific wavelengths. For example the Lyman-break that is used to find distant galaxies and about which Russell told you in his post is always located at the same rest-frame wavelength and shifts to redder wavelengths the further away the galaxy is. Another important feature is the so-called 4000 Angstrom break. The 4000 Angstrom break (at 0.4 micron in the figure to the left) occurs because many heavy elements in the atmospheres of old stars in the galaxy absorb some of the starlight around this particular wavelength. The brightness of a galaxy changes noticeably from the left to the right of this break, so in one filter band the galaxy will be brighter and in the other one it will be fainter. A comparison with model galaxies and the location of these jumps in brightness allows us to estimate the redshift of the galaxy. The better the shape of the SED and features such as the mentioned spectral breaks are sampled with the images, the better we can determine the redshift. A redshift determined from galaxy images where no spectrum is available is called a 'photometric redshift'. For large galaxy surveys, the latter method is used to measure redshifts for many objects at the same time. 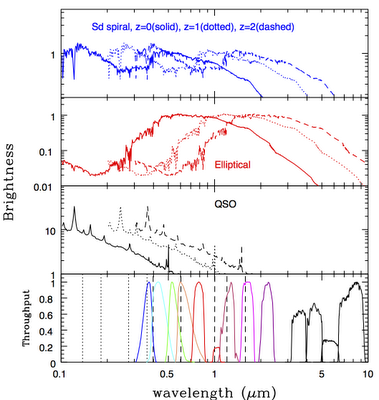 Although the uncertainties for photometric redshifts are larger than those for spectroscopic redshifts and photometric redshifts can be wrong for single objects, researchers gain better statistics with large sample sizes. Furthermore, the redshift distribution of that sample will be correct on average. While CANDELS itself is focused on imaging data, many spectroscopic surveys have been undertaken in these deep fields and new surveys are always ongoing to obtain more spectra. A lot of CANDELS science you will read about here will make use of photometric redshifts.